Bayama is the Bemba word for “Uncle”. And Bayama's is the place, where you are welcome like an uncle (or aunty!) and where you can meet new and old friends. Bayama’s Lodge, Pub & Grill targets the market niche for personalized, high-quality accommodation and tourism services. While centrally located, we offer a green and quiet oasis for your privacy and security. 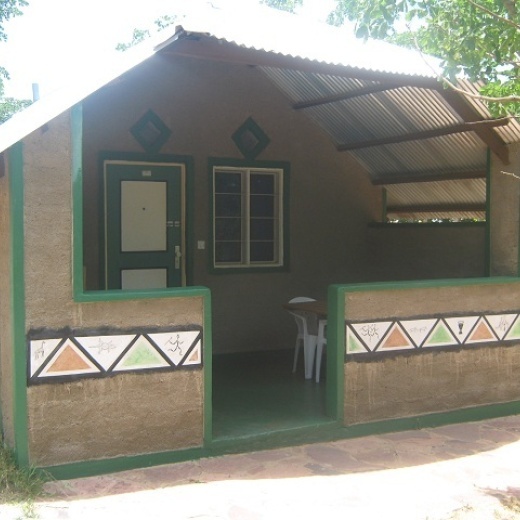 Our lodge offers 5 fully equipped chalets/cottages and 3 spacious double-rooms. Every unit is self-contained and sleeps up to 4 guests. Your individual veranda gives you the opportunity to relax in a lush and natural environment. In the main room you’ll find a double bed (additional beds on request), TV, wardrobe, sitting area and office desk. Your individual veranda gives the opportunity to relax and to enjoy barbeque (braai) in a lush, natural setting. In the moment we offer four cottages with individual service, an extension to eight cottages is in preparation. Enjoy your meals in our spacious new restaurant or on the veranda. Bayama’s offers a variety of traditional and international meals, as well as snacks and take-away. In our bar you will find a wide range of beverages and entertainment with pool and darts. Strategically located at the junction Great North Road and Kasama Road, Mpika can be reached easily, either by individual or public transport. A days drive (ca. 640Km) from Lusaka, Mpika is more than a stop-over to Kasama (ca. 230Km) and Nakonde / Tanzania (ca. 390Km). Many bus / coach services offer budget trips for adequate rates and the bus station is only a few hundred metres away. The TAZARA railway station is the biggest along the Zambian railway line and a trip with TAZARA gives you the opportunity for an adventurous “Travel in Time”. Bayama’s offers you a pick-up-service from and to both stations on request. In our spacious restaurant you will find your privacy, while enjoying traditional and international meals and snacks.